True crime adaptations have been a staple of many national cinemas ever since film began. One of the earliest (possibly the first) feature-length films ever made was an Australian flick called "The Story of the Kelly Gang" (1906) about outlaw Ned Kelly and his boys. Virtually all films in the genre take liberties with the facts, often to turn the protagonist into a more sympathetic character or at least a more understandable one. In “Vengeance is Mine” (1979), director Shohei Imamura plays fast and loose with the true story of serial killer Iwao Enokizu, but he has little interest in shining a light onto his murderer's dark psyche. Iwao (played by Ken Ogata) comes from a devout Catholic family, and came of age during the 1930s when Japanese Imperial forces were persecuting Christians and other non-conformists. Aha, you might think! Here we see the roots of Iwao's future madness. Or maybe it's his own troubled relationship with his oppressive father (Rentaro Mikuni), the devout man of God who uses his faith as a convenient battering ram to shame others but seldom lives up to his own proclaimed standards. Both are possible explanations for Iwao's psychosis and other possibilities are raised as well (it's always a woman's fault at some point, isn't it? ), but Imamura's hectic, lazy, time-jumping narrative doesn't focus on any one of them. At the beginning of the film, Iwao brutally clubs and stabs a co-worker mostly because he's there and therefore in Iwao's way. None of his killings really follow a pattern; some are acts of opportunity (he kills an old man because he needs his apartment for a little while), others acts of passion. If you really want to look for an answer, you can probably find one, almost certainly one wrapped up in Iwao's Catholic upbringing, but first you'd have to reject the null hypothesis: that's just the way God made him. Nothing in the film persuasively argues otherwise. Even when we see him as a child, he has already sprouted into a li'l sociopath ready to bludgeon to death an officer who appropriates his father's boat. In some cases, Iwao seems to enjoy his killings; other times he just doesn't care. In the end, Iwao's father offers the only insightful observation: "You can only kill those who never harmed you." Since the film's title is taken from a Biblical passage, in which the Lord proclaims "Vengeance is mine, I shall repay" this raises some interesting possibilities. Like most sociopaths, Iwao is a complete narcissist and has taken on the presumptive role of God. But either Iwao has totally screwed up and misunderstood who he needs to "repay" or Imamura is making a rather pointed critique about the Christian God's occasional lapses in judgment on the "revenge" front. Structurally, the film plays out like a neo-noir, following Iwao's 78-day killing spree, but also jumping back and forth to other moments in his life. His forced marriage to Kazuko (Mitsuko Baisho) becomes a key plot strand, particularly after relations between Kazuko and Iwao's father begin to heat up. Imamura lays on the grotesque elements with a heavy brush. Iwao's cold-blooded slaughters are hardly the worst of it. The most grueling scene for me (even though it is not graphically depicted) is one in which the father and Kazuko take revenge on a disobedient dog by burying it up to its neck and pouring boiling water on its head, a reminder of Deuteronomy 21:18-21 which advocates that parents stone to death any disobedient sons. Virtually every major character in the film is pretty wretched, even Iwao's nominal love interest Haru (Mayumi Ogawa) and her lecherous mother, who herself is an accused murderer. Imamura's detached but only semi-cynical approach to the subject produces some interesting results, and the ending (which I will not spoil here) arrives so far from left field it defies any rational analysis. Nonetheless, I found it only sporadically engaging, and soon got tired of the multiple flashback structure, even when it is employed to ironic effect. The film moves briskly in parts, lingers aimlessly in others, but wears the viewer's patience (or at least this viewer's patience) at a bloated 140 minutes. Ogata is a natural as the icy-cool lady killer, but since he's all surface (by design; he was born an empty flesh-shell sociopath) there's just not enough to sustain interest for so long. Still, "Vengeance is Mine" is not easy to forget or to dismiss as mere exploitation. It's a look into the heart of a killer that reveals nothing about its subject, but perhaps a whole lot more about the ones doing the looking. Though the main characters are Catholic, the film is more a journey into the pit of Calvinist depravity one expects to see in a Paul Schrader work. The film is presented in its original 1.66:1 aspect ratio. The 2007 SD transfer was already excellent, but this 1080p transfer still offers a noticeable upgrade. Image detail is sharp throughout, but the more obvious difference is the richness of the colors. The transfer isn't quite as squeaky clean as some of Criterion's top high-def releases, but the very minor instances of damage are probably attributable to the source print. There's certainly worth complaining about. The LPCM Mono track is crisp and fairly straight-forward, not particularly deep or dynamic but it more than does the job. Not much to say here. Optional English subtitles support the Japanese audio. The 2007 Criterion DVD included only a short interview with Imamura (10 min. ), filmed in 1999 for the Directors's Guild of Japan along with a Trailer and a Teaser. Those are the only stand-alone extras offered on this 2014 Blu-ray release as well. However, Criterion has added a commentary track by the great critic Tony Rayns. It was originally recorded in 2005; it is the same (as far as I know) as the one offered on the Eureka DVD release from 2005 and their Blu-ray upgrade of 2010. The 32-page insert booklet includes a fine essay by Michael Atkinson, a lengthy interview with Imamura conducted by Toichi Nakata, and the short essay “My Approach to Filmmaking” by Imamura, all the same as in the 2007 Criterion booklet. Imamura began his career as an assistant to Yasujiro Ozu, but he never sought to emulate the master when he began directing his own films. Instead, he become one of the stalwarts of the Japanese New Wave, forging a more kinetic and visceral style of his own. 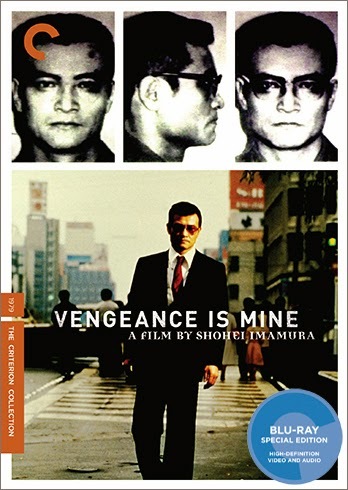 "Vengeance is Mine" is generally considered one of his best films, though he won the Palme d'Or at Cannes for his remake of "Ballad of Narayama" (1983). Imamura continued making films all the way into the 21st century, by then with his children working as his screenwriting team. Imamura died of liver cancer in 2006 at the age of 79.